“What happens to your brain as it slips into unconsciousness? A new technique allows researchers to view real-time 3-D images of a patient undergoing anesthesia using the drug propofol, and the findings show that consciousness isn’t suddenly switched off, but rather fades as though a dimmer is being dialed down. The research also suggests that consciousness resides in the connections between multiple parts of the brain, not in any single region. The images show that changes in the anesthetized brain start in the midbrain, where certain receptors for a neurotransmitter called GABA are plentiful. Drugs like propofol act on these GABA A receptors, mimicking and enhancing the effects of GABA, which inhibits cellular activity. From the midbrain, changes move outward to affect the whole brain; as propofol’s message spreads from region to region, consciousness dissolves. Although anesthesia has been widely used since 1846, when a dentist first demonstrated the effects of ether at Massachusetts General Hospital, until recently very little has been understood about how it works. Even though scientists know that anesthetic drugs like propofol affect GABA in the brain, how that actually eliminates consciousness still remains a mystery. Pollard explains, however, that propofol alters “the balance between inhibition and excitation in the brain,” shifting the balance of activity toward the inhibitory circuits. At first, this produces a paradoxical result. “When inhibition is inhibited, you first move into a stage of excitation or mania,” he says, noting that this usually occurs too quickly to be observed with modern anesthesia. But the brief sense of euphoria that some people experience before losing consciousness from propofol may reflect this loss of inhibition (and may also account for Michael Jackson’s taste for the drug). “You then begin to inhibit the excitation and the patient becomes more sedated and loses consciousness,” he says. That’s why in the video the brain appears to become more active while unconscious: it’s showing the increased action in inhibitory circuits. “What we’ve got supports the idea that there are several levels [of consciousness] rather than [an on/off] switch,” he says. 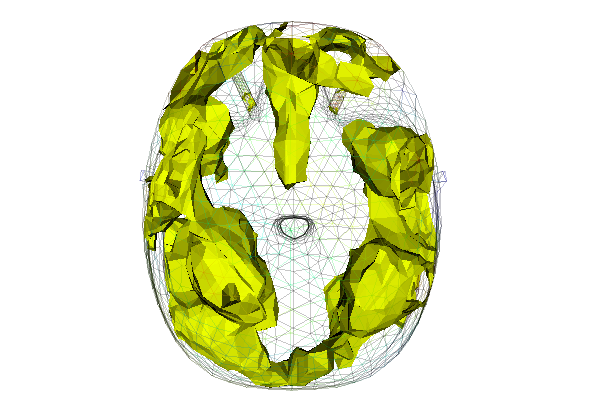 Pollard’s group used a new technology called fEITER, for functional electrical impedance tomography by evoked response. To measure brain activity, the technique uses imperceptible electrical currents produced by electrodes placed on the head. Unlike fMRI, it doesn’t require the patient to be placed inside a magnetic field, which precludes the use of metal devices, so the laptop-size fEITER instrument could be used in an ordinary operating room. “We can get lot of mileage [from fEITER in research] to separate out anesthesia, sedation and consciousness,” says Pollard. The device could also potentially be used to rapidly determine the site of a stroke or the extent of a brain injury. Ultimately, fEITER might be used to make sure that patients do not experience any consciousness during surgery. About 1 in 1,000 to 2,000 patients experiences some degree of consciousness under anesthesia, which can obviously be extremely traumatic. However, it’s difficult for doctors to determine when consciousness is occurring, because drugs used in surgery also paralyze the body and affect measures of stress like blood pressure. A better understanding of what consciousness is could help eliminate this possibility.